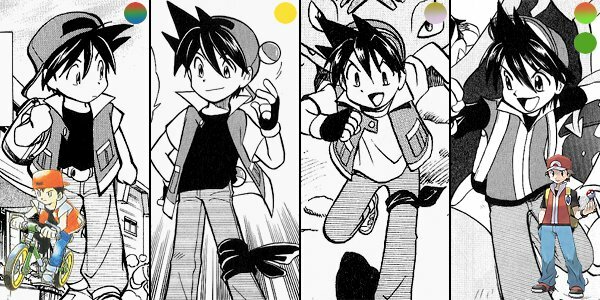 Red is the first main protagonist of the Pokemon Special manga, and he began his adventure as a rookie trainer from Pallet Town who actually believed he was better than the others. This was evidenced by his impulsive challenge against Mew when he first saw it in the western woods of Pallet Town, during which he suffered his first overwhelming defeat, and made him consider meeting Prof. Oak to properly learn the ways of being a Pokemon trainer. His pride was gradually toned down as he weathered through various defeats and victories throughout his journey, and when he reappeared again in the FRLG series, despite having earned fame across the land from his various heroic deeds, he remained humble and grounded to earth. His character is of the typical hero stereotype fighting for justice, ready to sacrifice himself for others, and is depicted with occasional comical traits. He often makes startling comments that throw the people around him, but seems totally oblivious to it. Pokemon battling is a core virtue in his life, and it is no surprise that Professor Oak gave him the title the Battler. Red cherishes the bond he shares with all Pokemon and treats them as his friends, allowing him to gain trust and respect from not only his own team members but also wild Pokemon including legendaries. Among the three Kanto legendary birds, he is closer with Articuno, who helped him protect Gyara from Team Rocket's Muk on the Seafoam Islands, and as a result used up its strength and got captured by TR. Red also captured and earned the trust of the genetic Pokemon, Mewtwo, and the two reunited to fight alongside each other in the FRLG series. However, when it comes to true bonding, Deoxys no doubt has the closest connection to Red, since it accidentally absorbed Red's blood sample at Team Rocket's storage room, and from that moment on treated Red as its roots. Red and the grandson of Professor Oak, Green, started out as rivals, but eventually became best companions. The two went through a lot and gained a lot from each other, Red learning to recognize his limits from Green while Green learning to truly care for his Pokemon. Red also shares a close bond with Blue, whose mischievous character caused him quite a lot of trouble when they first met, but ended up being the solution to many crises later on. The three of them are collective known as the Pallet Dex Holders, and have gone through many adventures together. There have been hints along the series suggesting that the Viridian young trainer, Yellow, and the Cerulean Gymleader, Misty, are both attracted to Red. Red himself has not shown a clear predilection for his love interest, but as of the latest plotlines in the series, he apparently shares a closer bond with Yellow. As for his juniors, Gold has a certain respect for Red as a senior, and after helping him out of an embarrassing situation at the end of the GSC series, invited him to train together on Mt. Silver. The tactics they developed and practiced at that time proved to be useful later on when fighting Guile Hideout in the Emerald series. Another Dex Holder, Sapphire, looks up to Red as her idol after learning his accomplishment in claiming champion at the Pokemon League at the age of 11. Red's initial design was based on the main protagonist of the original Gameboy games, Pokemon Red and Green, with the only difference at the prominent spiky hair that stuck out from in front side of his backward-worn cap. After defeating Lt. Surge at the Silph Co. building, he snatched a pair of insulating gloves from him. In the Yellow series, his attire basically remained the same with the exception of a new red band which he tied around his left thigh on top of his jeans. In the GSC series, his T-shirt has changed from black to white, and he no longer wore his cap backwards. In the FRLG series, his attire was completely revamped to match the outfit of the male protagonist of the GBA games, Pokemon FireRed and LeafGreen, but his hairstyle remained unchanged if not made wilder. This design carried on into the Emerald series, except that he regained his pair of insulating gloves after he was revived from his petrified state. Over the years, his eye colour has ranged from brown to a deep red. Red's journey began when he encountered the mirage Pokemon, Mew, in the western woods of Pallet Town one night. A bitter defeat led him to visit Prof. Oak, the top authority in the Pokemon world, after which he added Bulbasaur to his team, and set out on his long voyage around Kanto. Apart from his ongoing rivalry with Oak's grandson, Green, he also met Blue, a girl full of tricks and deceits. While his journey started with generic Pokemon captures and gym challenges, Red gradually found himself intertwined between Team Rocket's many secret works, and together with his companions, has more than once shattered their evil schemes. At Celadon City, he captured an Eevee which was the result of TR's biological engineering, and has since then allied himself with Brock, Misty and Erika, gymleaders who constitute Kanto's Circle of Justice. 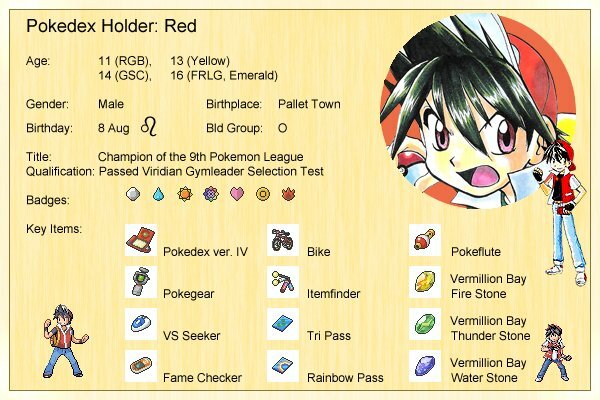 Red's journey became tougher and tougher, and he soon encountered the Kanto legendary birds, which fell victim to Team Rocket's evil technology and was merged into Zapmolcuno. Together with Green and Blue, Red had a big showdown with Team Rocket at Saffron City's Silph Co. building, which eventually dissolved the evil organization. After that, Red helped Blaine recapture another product of TR's biological engineering, Mewtwo. He then had one of the fiercest battle of his life at the Viridian Gym against Giovanni, who was actually the leader of Team Rocket. Later, he formally battled his rival, Green, at the Indigo Plateau Pokemon League Tournament, and after an intense battle calling for both skills and intelligence, emerged victorious as the Champion. 2 years after the Kanto Pokemon League Tournament, Red one day received a letter of challenge from a man named Bruno. He went missing after attending the challenge, while a very injured Pika returned to Professor Oak's Science Lab. Yellow started on a journey to search for Red, and it was later revealed that Bruno's letter of challenge was actually a trap to lure Red to participate in the Kanto Elite 4's evil scheme. Having refused the offer and unable to tell them the whereabouts of Giovanni, Red was targeted by Lorelei's ice handcuffs which froze him at Mt. Moon. Red was eventually saved by a mysterious person believed to be Giovanni, after which he joined Green, Blue and Yellow to have a final showdown with the Kanto Elite 4 on Cerise Island. 1 year after the Kanto Elite 4 incident, Red fulfilled his promise to Yellow and sat for the Viridian Gymleader selection test. However, his injuries caused by Lorelei's ice handcuffs thwarted him from taking up the position. He set out to Mt. Silver where the mountainous hotsprings were said to be therapeutic, and encountered Sabrina who was also there for the same purpose. Later, Red returned just in time to prevent the dislodged Magnet Train from crashing. He and Green then headed to the final battleground following the lead of Sabrina's Spoon of Fate, arriving at the Ilex Forest to help Blue fight Lugia and Ho-oh with the three legendary birds, and eventually defeating the evil Mask Of Ice together with the other Kanto and Johto Dex Holders. 2 years after the Mask Of Ice incident, Red and Green returned to Pallet on Prof. Oak's request. The professor's absence, the confiscation of the Pokedexes, together with other unexplained happenings soon led the boys to the Sevii Islands, where they learnt of the existence of a mysterious yet powerful Pokemon from outer space named Deoxys, and that Giovanni has resurrected Team Rocket. After inheriting the ultimate attacks on Two Island, Red had his first showdown with Deoxys on Five Island, albeit being totally overwhelmed. Nearly losing all his will to fight, Red eventually stood back up again, and together with his companions, including the once missing psychic mutant, Mewtwo, challenged Team Rocket on Seven Island's Trainer Tower. The battleground soon shifted back to Viridian City, where Red and Giovanni had their rematch on the TR Battle Airship with Mewtwo facing off Deoxys. Though claiming victory after a bitter battle, an internal conflict among the TR Beast Trio quickly set the Battle Airship out of control. It was only then that Red finally understood the close connection he shared with Deoxys. At the very last moment, the mirage Pokemon, Mew, appeared and saved the airship from crashing. Yet, just when it seemed that the crisis was over, a mysterious attack unleashed by the Beast Trio's Storc collided with the five Dex Holders, and turned them into stone. 2 months later, Mr. Briney shipped the five petrified Dex Holders, Red, Green, Blue, Yellow and Silver, via the S.S. Tidal to the Battle Frontier. The five were placed on the top floor of the Battle Tower at the Pokedex Holders' corner in the disguise of actual statues. From a report Brinca snatched from Team Rocket at the Trainer Tower, Prof. Oak learnt of the wishing powers of the mirage Pokemon Jirachi, which appeared to be the only way to revive the Dex Holders. Emerald, Ruby, Sapphire, Gold and Crys were dispatched to the Battle Frontier in stages to capture Jirachi and safeguard it from the evil Guile Hideout, who was also after the wishing Pokemon. Emerald eventually managed to come to terms with his own feelings with Pokemon, and channelled his wish to Jirachi, reversing the petrifaction of the five seniors. Red regained his outfit which was brought to the Frontier by Gold, and quickly engaged himself in the battle against Guile Hideout. His Poli teamed up with Gold's Politaro to destroy Guile's armour, and Saur joined forces with Crys's Megapeon and Emerald's Sceptile to fire off a Triple Frenzy Plant to disperse the giant sea monster together with the other Dex Holders' starters. Red accidentally released Saur along with other Pokemon at Professor Oak's Science Lab, and later found it dwelling inside the abandoned Viridian Gym. After working together to defeat a wild Machoke, Oak gave this Pokemon to Red and it quickly became a reliable member on Red's team. Saur evolved into an Ivysaur at the gates of Celadon City, and later into a Venusaur at the Silph Co. building during the showdown with Team Rocket. It has adept and powerful vines, and plays both the supportive and offensive role on Red's team, recently having inherited the ultimate grass move Frenzy Plant from Brinca on Two Island. It has been traded to Green twice, the first time due to an accidental Pokeball switch in the RGB series, and the second time during the FRLG series when Red, Green and Blue had to use the ultimate attacks to free Mewtwo from the M2 Bind. Its ultimate attack was also used to defeat Guile Hideout's giant sea monster in the Emerald series. Poli is Red's very first Pokemon, and it evolved into a Poliwhirl to save Red from drowning when he was little. During Red's battle with Lt. Surge on S.S. Anne, Poli was defeated and thrown into the sea, but the powers of the mysterious Vermillion Bay Water Stone evolved it into Poliwrath, allowing it to overpower Lt. Surge's Electrabuzz. It has a diverse range of attacks, and is the powerhouse on Red's team. Its Damp ability negates all explosive attacks, making it the perfect Pokemon to counter Jagura's exploding Forretresses in the FRLG series. In the Emerald series, it teamed up with Gold's Politaro to destroy Guile Hideout's armour. Red captured this Pikachu at Pewter City where it caused havoc at the market. It was initially extremely antagonistic, but throughout their long journey together, it soon became one of Red's closest companions. In the Yellow series, it was Red's only Pokemon that managed to escape from the Kanto Elite 4, and later joined Yellow to go in search of Red. During the time, it learnt to manipulate its decoy created by Substitute into a surfboard, allowing it use the move Surf. It joined Yellow's team temporarily again in the GSC series when Red went to heal himself at Mt. Silver, and together with Yellow's Chuchu, produced an egg at the Goldenrod Daycare Center. Red relies heavily on Pika, and has used it against many major opponents including Giovanni, and legendary Pokemon such as Mewtwo and Deoxys. It was accidentally traded to Green during the RGB series. At the end of the FRLG series, it escaped the petrifaction with Chuchu, and headed towards the Battle Frontier for the final battle in the Emerald series, where it unleashed the ultimate electric attack, Volt Tackle, in conjunction with Chuchu and Pichu, to defeat Guile's giant sea monster. As an Eevee, Vee was used by Team Rocket as a beta test Pokemon for their scheme to merge the legendary birds. It has been biologically altered through traumatic procedures, enabling it to evolve and devolve freely between Vaporeon, Jolteon and Flareon. Red captured it at Celadon, and slowly helped it overcome its past. In the Yellow series, its altered biology was put to good use against Bruno with the help of the Vermillion Bay evolution stones. In the GSC series, it evolved into an Espeon and became free from all the biological alterations done to it. It became acquainted with Blue's Ditty at the Battle Frontier. Red met this Snorlax on Route 12 where it was blocking the path of the cycling race. Using a honey-covered Saur as lure, Red woke it up and led it to the finishing line, eventually spending all his prize money on food for it. Lax has extremely high physical attack, and was often used to counter massive-sized opponents. It has fought Green's Machamp twice, once during the Kanto Pokemon League Tournament and the other in the Battle Path at Two Island's Cape Brink, both times falling victim to Machamp's Seismic Toss. Red resurrected this ancient Pokemon at Blaine's laboratory on Cinnabar Island from the Old Amber he received from Giovanni. Shortly after its resurrection, it managed to give Moltres a hard time and forced it to retreat. Being a quick and adept flyer, it is Red's main mode of aerial transport, and is strong enough to support the heavy weight of Red's entire team. Its Rock Head ability negates recoil damages from attacks like Take Down. In the Emerald series, it helped fight down the rampaging rental Pokemon at the Battle Tower. Red first encountered Gyara when Misty was trying to recapture this Pokemon after Team Rocket stole it. Later, when Red was in need of a Pokemon that knows Surf, Misty traded this Gyarados to Red for his Krabby. At that time, the bad memories of Team Rocket's traumatic procedures made it very ferocious, but Red and his team gradually helped it overcome its past. It has battled powerful legendaries like Moltres and Deoxys, and was temporarily traded to Green for Charizard during the GSC series. Red used this Sandshrew against two wild Magmars outside the Pewter Museum, under the watchful eyes of Giovanni. Red captured this Nidorino as a demonstration to a group of young kids at Pallet Town. When Bill accidentally merged himself with a Rattata in his Pokemon Transfer Machine, this Fearow mistook him as a real Rattata and carried him off into the air. Using Poli's Double Team, Red tricked and captured Fearow to save Bill. Red captured this Nidoqueen at the Safari Zone by accident, causing two Nidokings to go after him. Red captured these Nidokings at the Safari Zone. He blinded one of them with a rock, which then went on a rampage. With the help of a Safari Victreebel he captured, he managed to trap this Nidoking into a Safari Ball. Red captured these Victreebels at the Safari Zone. One of the Victreebels captured Red as food for evolution ritual of its Weepinbells. Fortunately, Red was able to free himself and captured this Victreebel when a Nidoking intruded. Red captured these Weepinbells at the Safari Zone. They captured Red along with other animals as food for their evolution ritual, but Red successfully got free with the help of Mecha-Pidgey. Red captured these Bellsprouts at the Safari Zone. Red captured these Exeggcutes at the Safari Zone. Red captured these Parasects at the Safari Zone. Red captured this Krabby when he accidentally swapped his usual team with Green. After using it briefly to battle and capture Eevee, he later traded it to Misty for her Gyarados in order to have a Pokemon that knows Surf. This Pokemon of Green's has come under Red's possession three times. As a Chameleon in the RGB series, it was accidentally exchanged to Red when the two boys scattered their Pokeballs on the floor. Although it refused to obey Red initially, its coldness eventually succumbed to Red's gleeful ways. As a Charizard, Green temporarily traded it to Red in the GSC series for Gyarados, to assist Red's journey towards Mt. Silver. It was temporarily traded to Red again for Saur in the FRLG series to give Red a means of flying since Aero was severely injured by Deoxys. Scyther has been accidentally traded to Red when the boys scattered their Pokeballs at the countryside of Celadon. Being Green's very first Pokemon, it was used to Green's cold ways, and refused to obey Red initially, but Red's gleeful ways eventually softened its exterior. Along with Charmeleon, Scyther, Golduck and Machoke, this Pokemon was accidentally traded to Red in the RGB series. Refusing to obey Red initially, just like its companions, it eventually softened to Red's gleeful ways. Golduck was accidentally traded to Red along with Green's other Pokemon in the RGB series. Though it refused to obey Red and went on a rampage at first, it eventually got accustomed to Red's friendliness. Along with its other companions in Green's team, Machoke was accidentally traded to Red whom it refused to obey at first. When Red's friendliness eventually won its trust, it followed Red's orders to fight a Ninetales which Green was battling. During this 'trade-back' process, it evolved into a Machamp. Blue temporarily lent Turtley to Red in the GSC series when he venturing towards Mt. Silver to heal his injuries. Generating a powerful propelling force by blasting water out from its cannons, it gave Red additional means of aerial transport in the perilous mountainous area. In the GSC series, when Red and Green joined Blue in her battle against Lugia and Ho-oh with the three legendary birds, Red became in charge of controlling Articuno. Their bond dated much earlier back in the RGB series however, when Red encounterd Articuno on the Seaform Islands where this legendary bird of ice protected Red's Gyarados, eventually causing it to use up its powers and fall victim to Team Rocket's capture. This is one of the 2 Deoxys which landed on Earth as mutated viruses via the Grand Meteor. When Team Rocket stole them from the Mossdeep Space Center, this Deoxys, named Inividual 2, escaped and began residing on Birth Island in the Sevii Islands. However, in its rampage during the escape, it accidentally absorbed Red's blood sample Giovanni kept in TR's storage room. As a result, it deemed Red as its roots, and pursued Red. Later, it was captured by Giovanni to fight the Dex Holders, but eventually regained its freedom. It then teamed up with Red to destroy the exploding Forretresses on the TR Battle Airship. At the very end, it departed to look for its companion, Individual 1, before heading towards a city in the distant land of Sinnoh.